This lovely spacious first and second floor apartment is situated in the heart of the popular 5 * resort of Vale Do Lobo. It is close to the many facilities this resort has to offer and is furnished to a high standard. The apartment comprises of a new and fully equipped open plan kitchen and dining area leading on to a spacious lounge area with Sky television and WiFi. Adjoining the lounge is a sunny south facing terrace with dining table and chairs. Spacious master bedroom with Juliet balcony, fitted wardrobes and modern bathroom with bath and shower. Second double bedroom with twin beds and fitted wardrobes leading on to a sunny terrace with sun loungers. Second modern bathroom with shower. Both terraces have lovely sunny views over mature and well kept gardens. On request air conditioning and underfloor heating are available as an extra cost. Air conditioning is only normally needed in July and August and occasionally September. Underfloor heating may be needed in December and January and occasionally February. It is 3 mins walk to the tennis academy, 2 mins walk to the Childrens playground and 12 mins walk to the beach and the 'Praca' where the main pool is located together with bars and restaurants. There is car parking directly outside the apartment and the resort bus stop is 2 mins away. With only 4 apartments in the block the apartment offers privacy and space. It is the ideal location. We are also members of the VDL Proprieters Club which means guests are entitled to purchase a Resort Welcome Card which gives exclusive discounts at shops and restaurants and 40% off green fees. It also includes free use of the resort shuttle bus (full details and costs available on request). The first floor bathroom comprises full length bath with shower over, wash basin within vanity unit and large mirror over, WC, bidet and heated towel rail. The bathroom is fully tiled. The second floor fully tiled bathroom has a shower, WC, wash basin within a vanity unit with mirror and spotlights over. Sitting room/diner with glass top dining table, comfortable 3 seater sofa and 2 easy chairs. Glass coffee table. 2 side tables with lamps. Sky TV Freeview, leading to a south facing sunny terrace. Fridge/freezer, cooker (oven and hob), washing machine, dishwasher, microwave, kettle, coffee machine and toaster. Plenty of work space. 2 south facing terraces. One off the main sitting room with dining table and chairs. The other terrace is off the 2nd bedroom with 2 sunloungers. 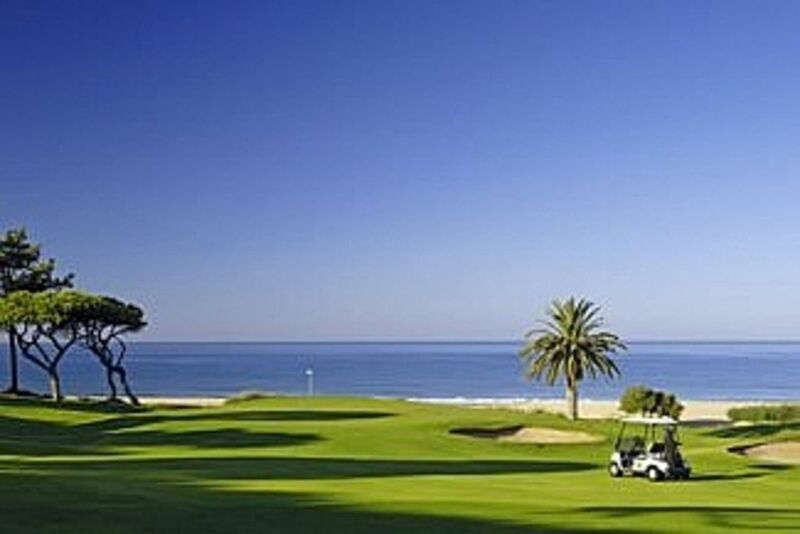 Vale Do Lobo has 2 excellent golf courses which are 2 mins drive from the apartment. There are many other courses close by. Quinta Do Largo North and South courses are a 10 mins drive. Pinheiros Altos is a 10 mins drive also. The testing Vila Sol is a 20 mins drive. The 5 Vilamoura courses including Victoria are also a 20 mins drive away. San Lorenzo is a 15 mins drive and the excellent Quinta De Cima and Quinta Da Ria are 45 mins away. Beautiful golden beaches washed by the Atlantic are just a 5 min walk. The Vale Do Lobo beach is rated one of the finest in Europe and is very safe for swimming. It has lifeguards on duty all day. All beach facilities are there including sunbeds with parasols, banana boat for the children, pedalos and a variety of beach bars and restaurants. Easy access by hire car or taxi from Faro airport 20 mins and we can arrange car hire. Faro Town 20 mins with many shops and Marina. Almancil is the nearest town, a 10 min drive with many shops and restaurants. Quinta Do Largo is 10 mins with designer shops and bars and restaurants. Vilamoura and aquapark is a 20 mins drive and children would love a day trip to Zoomarine a 30 min drive en route to Albufeiria. The fish market at Quateria is only a 15 mins drive and is worth a visit. For sightseeing visit Tavira old town 40 mins east or Silves and the Monchique hills 45 mins west. At the beachside Praca you will find many bars and restaurants with food from around the world and many with childrens menus. There is also crazy golf, children's club, free live music for everyones enjoyment, a cash point, a newsagents selling papers and suncream etc.This is also where you will find the main swimming pool with children's pool overlooking the beach with sunbeds and parosols. Hair and Beauty can be found at Vale Do Lobo reception just 2 mins from the apartment by car together with the golf reception, spikes bar, golf shop, cash point, bank and many excellent shops. Booking Notes: To reserve the apartment we require 25% of the total as a deposit (non refundable) at the time of booking with the remaining 75% to be paid no later than 6 weeks prior to your arrival date, together with a (refundable) damage deposit of £200. Once the deposit (or full payment) is received the owner will write/email you formally to confirm your booking and include a receipt of payment. Once the full balance is paid the owner will contact you with details of keys etc and offer any assistance. Changeover Day: Saturday to Saturday but the owner is prepared to be flexible apart from August. Arrival after 3pm and depart by 10am. Notes on prices: Air Conditioning is available at £8.00 per day payable on booking. Underfloor heating is available at £7 per day payable on booking. Additional beds charged at £5 per night where party exceeds 4 persons (max persons) for sheets and towels. Prices displayed are for 7 nights. Damage deposit (fully refundable) of £200 payable with balance.